If you are drawn to read Wendy Doniger’s The Hindus – as I was – because you see in Hinduism an example of a cultural-spiritual tradition that has managed to keep alive – right into modern times – a view of a sacred universe (sacred time, sacred geography, sacred cosmology, sacred social customs and social roles, sacred geometry and architecture, rites, rituals, and celebrations, etc.) and a robust set of experiential spiritual practices (puja, kirtan, yoga, meditation, etc.) then you are likely to be disappointed by this book. It is written, as far as I can tell, entirely from within the same western, modern, secular-academic point of view that has largely rejected a sacred vision of the cosmos and that has largely dismissed whatever tried-and-tested systems of spiritual practice we may once have had. Doniger conveys almost none of the spiritual vitality and seems not to recognize any of the practical spiritual knowledge that other writers and teachers show to be embedded in Hindu scriptures. If anything, she belittles these aspects of Hinduism in just that sort of way that modernized people as a group tend, unfortunately, to do, believing themselves to “know better” and to be more “sophisticated” than people who maintain their ancient traditions. So if you are looking for a view of Hinduism that will lead you beyond the limitations of the modern materialistic-mechanistic worldview, this is not the book for you. Here is just one example: On page 176, Doniger quotes, from the Kaushitaki Upanishad, a description of the sort of experience one might encounter after bodily death that determines the trajectory of one’s soul. This upanishad says that upon dying, one goes to the moon and must answer its question, and that answering correctly or incorrectly is what determines the soul’s next steps. Now, obviously, from a modern, materialistic, rationalistic point of view, this is all silly, superstitious nonsense and so it would be very easy to dismiss it as such. But we should expect more than this kind of knee-jerk, superficial response from a person who holds herself up as a serious scholar. But rather than exploring what these strange (to modern, western ears) ideas and images might refer to in metaphysical terms (for example, I happen to know that there is a strong connection between the moon and the mental faculty in Hindu metaphysics; so this passage from the unpanishad could be a way of saying that the trajectory of the soul after death is dependent on the level of mental development one has attained during bodily life), Doniger takes the easy way out – the way that will find easy acceptance among her readers who hold modern, mechanistic rationalism to be the only valid viewpoint – and treats as silly the idea that “just one final postmortem exam…determines everything” (and then, in a telling footnote, likens this to a British school exam, clearly demonstrating how Doniger misconstrues and minimizes what may be another culture’s rich spiritual wisdom by filtering it though her own referents while maintaining a distant, scholarly, and disdainful stance.) If it ever occurred to Doniger that the people who authored Hindu scriptures were simply far more open to a broader range of (non-physical) experiences than herself (and, by extension, most westernized, modernized people) she never hints at this possibility in her writing. In my opinion, this is a major fault. For similar reasons, if you are drawn to this book primarily because of its subtitle “An Alternative History,” and are hoping for insight into more primal forms of Hindu spirituality – before the sanitized, homogenized, overly rationalized form of “Hinduism” as so many of us know it today emerged under the influence of Christianity and western colonialism – then you too are likely to be disappointed. 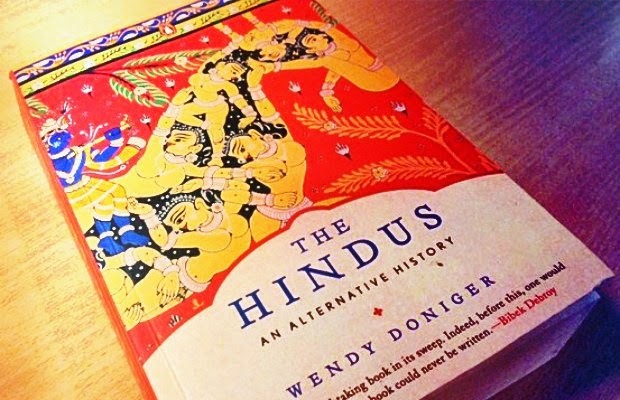 True, Doniger does bring out various strands of the Hindu tradition that are often overlooked, but again, not in a way that demonstrates their spiritual vitality. Her aim seems to be to support the modernist agenda that wants to say, “Look – since there are so many seemingly contradictory strands within this religious system, it’s all obviously just a bunch of made-up hooey and has no real truth.” In other words, Doniger presents the “alternative” Hindu tradition as mainly a complicated tangle of “myths” – in the negative sense of that word – that are best left to scholars like herself to figure out and that have no value other than providing a historical record of various peoples’ literary imaginings. I got the feeling that to Doniger, Hinduism is nothing but a huge body of literature waiting to be analyzed. On the positive side, I did get out of this book an even stronger sense of just how diverse a tradition Hinduism is and how it evolved over time. Many people will present Hinduism from one particular point of view (polytheistic, monotheistic, dualistic, non-dualistic, Vedic, Vedantic, yogic, tantric, philosophical, ritualistic, brahminical, populist, Shaiva, Vaishnava, etc.) as if any one of these points of view is the “true,” “authentic,” “original,” or most comprehensive form of Hinduism. But while Doniger does present a fairly broad spectrum of Hinduism, she does so, as stated above, while missing the inner heart of it all: the spirituality. In other words, in my opinion, she misses the point.